My father was born in Amsterdam, so I have an inbred need for cheese. Quality cheese. The kind you won't find at Tesco. Getting the good stuff recently got a little easier for us since a Cheesy shop opened up near Náměstí Míru. V's known about it for a few months and took me the other day. It's a little hard to find because the place is not well-marked. It's at Jugoslávská 23. 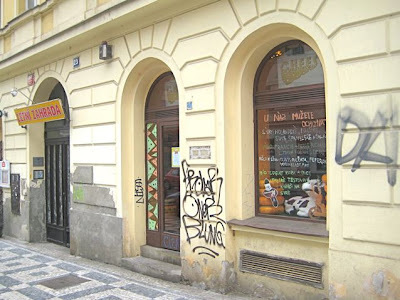 This Cheesy is connected to the shop of the same name at Letenské náměstí 6 in Prague 6. The Anglická location is also a relatively small place, with big wheels along the wall. A lot of it is Dutch. There was also Italian, Swiss, Spanish, and Balkan. Some of it is well-aged. If you are interested, the shop assistant might offer you a sample. 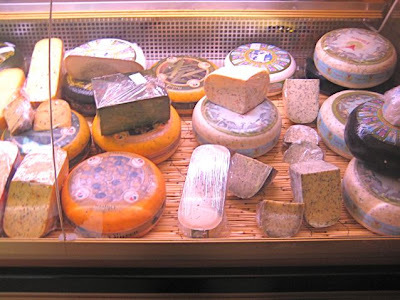 There were display cases full of cheeses blended with herbs and spices. We tried a cilantro-flavored cheese that was quite good. There was also a very green pesto cheese that V liked and I did not. There were a number of goat cheeses. They even have goat and sheep yogurt. 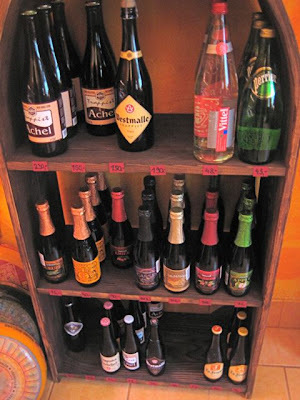 Cheesy was selling a variety of Trappist beers, but be warned - it wasn't cheap. 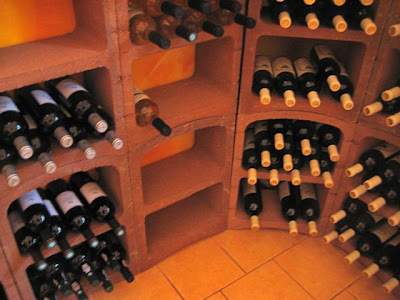 Some .375 liter bottles were around 90 CZK. There were a few in larger bottles that are 150-230 CZK. They also had fruit flavored beer. We bought a bottle of cherry for a friend who likes it. They also have a French wines from Gérard Depardieu and Pierre Richard. Anyway, I just thought I'd share the find with the cheese lovers out there who didn't yet know about the addition to the neighborhood. I thought about finishing with some kind of contrived joke about the all second mice out there who should check it out. But in the end, I decided against it. I hate that kind of cheese. There is a third shop on Sokolovska, 17 if I remember rightly. They do a lovely farmhouse Cheddar, and last time I was there they had a Trappist cheese which was also worth very crown. There is another Cheesy on Slavikova - I forget the street number but it's between Manesova and Polska. Sorry, for the ugly URL, it's not my fault :) Or you can enter to Google search this phrase: "cache:http://cheesy.vemeno.cz/cz/108/127"
Those Slovak cheese shops also carry some really good butter. Just noticed I had the address wrong -- it is Jugoslávská 23 (not Anglicka). Fixed the post. In Prague 3 there is one in Slavíkova, opposite Nám. Jiriho z Podebrad. In Prague 5, in Stefaníkova, near Andél, right by the stop Arbesovo Nám. In Prague 6, in Belohorská, between the stops U Kastanu and Drinopol. I've been to most of them, incl. the ones mentioned in the post and comments, and in each and every one I found the staff to be really friendly, helpful and, basically, people who like what they do. 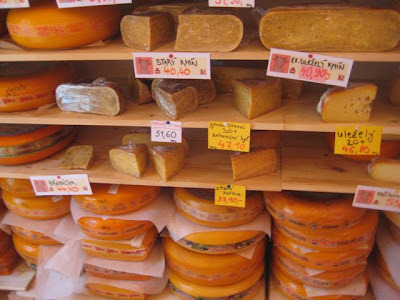 Not to mention that all the cheeses that I've bought so far have been really good, and very well priced, I think. About the Belgian beers. Yes, they are pricey, but worth it (at least most of them). Much more, IMO, than a 150CZK bottle of Beaujolais Nouveau or Italian Merlot. 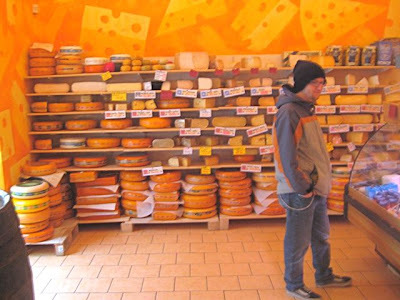 PS: Thos Slovak cheese shops are GOOD! I missed price examples in this post. My girl is cheese obsessed and I would love to buy some but it would have been great to see some price examples for the ones you picked up.. Thanks for a great blog anyhow! Sorry I didn't take note of the prices. We were in an out really quick and only our friend bought cheese this time. We just got a beer. 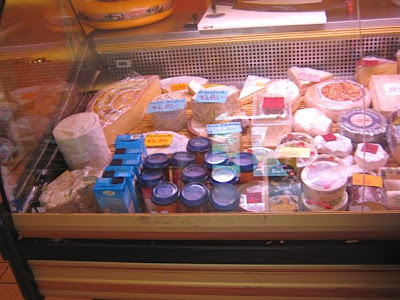 But if you click on the closer photo of the cheese in the post, you can see some prices. Thanks, Marek. I put the link into the post. Great chain of shops. There's one just one tramstop from Vyton which we go to regularly.